(November 30, 2018 – Toronto, ON) The Dancing Dogs of Dombrova will have its Canadian Premiere tonight at the Whistler Film Festival. As I wrote in a separate article, this 102 minute film “has its roots deeply set in Europe, both in its story and its style and execution.” I went on to comment that I thought the work of Director Zack Bernbaum exhibited “deft and gentle storytelling” in a film that has a mix of comedy and drama, pain and joy, light and dark. Bernbaum himself had described the film as “an absurdist drama.” I wanted to ask him a few questions and he agreed. RL: Where did the idea for The Dancing Dogs of Dombrova come from? The idea for The Dancing Dogs of Dombrova came from spending time with my Bubbie. I was at my parents’ house and my sister and brother-in-law’s dog started playfully jumping up and down. My Bubbie exclaimed that she was dancing! It was a very sweet and tender moment. My brain immediately went to “dancing dog”, and with my Bubbie being from Dombrova Gornicza, that quickly turned into “dancing dog of Dombrova”, which I thought was a pretty great title. I sat with the title for about a month until I made the connection that the story needs to be inspired by my Bubbie, as she was the impetus for its creation. The general story and characters formed pretty quickly after that connection was made. RL: From what I’ve read, this was your idea and you wrote the story or the outline or concept for the film and Michael Whatling turned that into a screenplay. What was your reaction when you first read his script? I came up with the concept and mapped out the general story and characters, but when I brought the project to Michael the story evolved and solidified. Once we were happy with the story, Michael wrote the script. Michael is a very talented and giving writer, and it’s always a pleasure to read his scripts. It’s one of the main reasons I keep collaborating with him. I know there will always be a level of quality and sophistication in the writing. When I first read The Dancing Dogs of Dombrova I was really taken in by the world Michael created and the unique character voices. He had crafted a touching and funny script, and I knew we had something special. Douglas Nyback and Katherine Fogler – The Dancing Dogs of Dombrova. RL: Tell me about the casting process for your lead actors, Katherine Fogler and Douglas Nyback. I think this was Katherine’s first feature? The casting process for Katherine and Douglas was actually incredibly easy. I worked with Douglas on a short film called Captive Love and we became friends, and Katherine and I were also good friends. When developing the script I started to hear their voices in my head so they were actually the only actors I offered the parts to. This is Katherine’s first feature film, and she is a joy to watch on screen. She and Douglas knew each other well – he was actually one of her acting coaches – so they had a great rapport that allowed for a very open and comfortable set. RL: One of the key elements of successful small movies is the supporting cast and this film has a brilliant supporting cast. Were you part of that casting process or was that largely the work of your casting director? Our amazing casting director, Bogdan Marhodin, was instrumental in finding, as you correctly state, our brilliant supporting cast. His enthusiasm resonated with every actor he met with during the casting process. I went to Romania with my co-producer and cinematographer Stephen Whitehead in October 2016, and we cast most of our roles during that week. Bogdan had sent me auditions tapes ahead of the trip, so my time in Romania was spent on call-backs and working with the actors. For the characters that we couldn’t cast in October, Bogdan continued sending me tapes in the months that followed and we finally locked our full cast during pre-production in January 2017. The director and casting director relationship is especially important, and finding someone who understands the tone and style you’re going for is so essential to casting the right actors for each role. 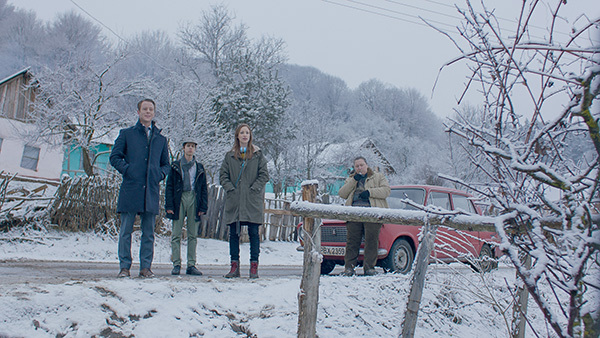 I’m so grateful to have worked with Bogdan and truly appreciate the tireless effort he brought to the film. RL: What was the single biggest problem in shooting a Canadian movie in Europe? You would think that the language barrier would be the biggest problem, but oddly enough – especially for a Canadian – the weather was our most difficult obstacle. It was freezing for much of the shoot and we had many exterior and night-time scenes. Even our interior scenes were extremely cold due to the fact that we were filming in old buildings that either didn’t have modern heating or had no heating at all. Somehow being inside was often colder than being outside. Keeping moral high is always important, but there were a couple days that were tough to get through. While the cold added a level of complication, it also created really unique moments. Seeing a character’s breath inside a historic church brings so much texture to the scene. You feel like you’re with the characters on this frigid journey. RL: How long was the shoot and I assume this was a digital shoot. What did you shoot with? We filmed for four weeks in the Transylvania region of Romania, which is absolutely beautiful. Both of my previous films were shot in three weeks, and I knew that to produce the film properly The Dancing Dogs of Dombrova required a longer shooting period. We were working in winter with a lot of exteriors and I had a specific look in mind that I didn’t want to rush. Plus we couldn’t do any reshoots so we needed to make sure we had everything. There was no safety net. As for camera, we filmed on the Arri Amira with vintage K35 lenses – which created a soft and rich aesthetic that provided a more classical cinema feel. RL: How long was the post-production process? The post-production process took approximately 8-10 months. With indie films you’re working with limited budgets, which often leads to protracted timelines. I don’t feel comfortable asking people to work on an indefinite basis, so we built in hard deadlines for us to hit. We did have some buffer in case certain parts of the process took longer than anticipated. I find working towards a deadline helps keep the creativity flowing and everyone pushing for the best product. Obviously the caveat is that you want realistic deadlines that allow for experimentation, but aren’t too extended so that the process begins to stagnate. It’s a fine balance and I think we hit that sweet spot. RL: Is there a theatrical release date? Currently there is no release date set. We’re in early talks with a couple of sales and distribution companies but nothing is set in stone. We’re planning on having a solid festival run and building buzz before releasing it publicly. RL: Any advice for first-time directors? My advice would be to know why you’re making the film, and further to that why only you can make it. Directing a film is a large responsibility – you’re creating something from nothing – so going into the process with the knowledge that you are the right person to tell this story is incredibly important. At the same time, it’s not all on your shoulders. There are so many talented and imaginative people working alongside you – especially your key creatives – and it would be unwise to ignore their impulses and advice. Listen and learn from them. They want to make just as good a movie as you do. Finally I would say to be kind to people. Making a film can be a very tense experience and a little human decency goes a long way. RL: What’s next for you? I currently have a few projects on my slate including Cut for Stone, which is also written by Michael Whatling and placed in the Top 50 of the Nicholl Fellowship. It’s a high stakes drama that follows a headstrong doctor and her covert international team as they sneak into war-torn Syria to provide medical aid to civilians. I also have a project in development entitled (An)Other which is written by Stu Marks. It’s a sister / family drama with a sci-fi twist. Stu just delivered a second draft so it’s still early days, but I’m very excited by the story and its potential. 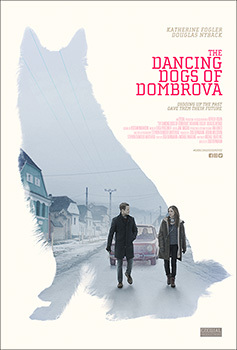 Click here to watch the trailer and learn more about The Dancing Dogs of Dombrova.